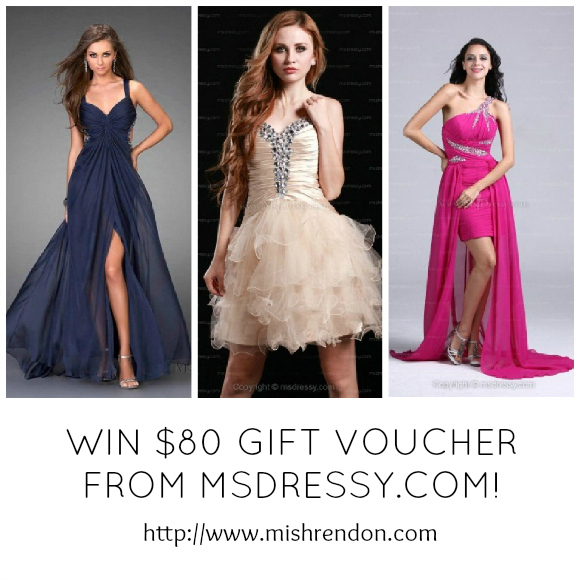 LBD & ONESIES - A Lifestyle Blog: Win $80 Gift Voucher from Msdressy! Are you girls prom-ready? Do you have a dress for that special occasion you're looking forward to? :) Msdressy.com, an online store which offers affordable wedding dresses, bridesmaid dresses, prom dresses and formal dresses, have something special for you! Follow the simple rules below and you'll have the chance to win an $80 gift voucher from Msdressy.com. Ready? Go! 4. Post this on Twitter: "$80 gift voucher from Msdressy.com is up for grabs at @superstarmishie 's blog giveaway! http://www.mishrendon.com/2013/01/msdressy.html"
4. Leave a comment here with your Facebook name, Link to Twitter post, and the email you registered in Msdressy. This is very important so they can send you the prize! I will choose the winners via random.org. This giveaway is open internationally and closes on February 4! Facebook fan of both: amy bolda pugmire. Hi, Thanks for this amazing giveaway.